We all know about the totally delicious diet buster we order at Italian restaurants... crispy fried chicken covered in thick marinara sauce and tons of cheese. And it doesn't stop there - put all those calories over a huge plate of pasta and you've got Chicken Parmesan. Be still my heart. If you're looking for a lower calorie option with the same great flavors, this burger is just the thing. 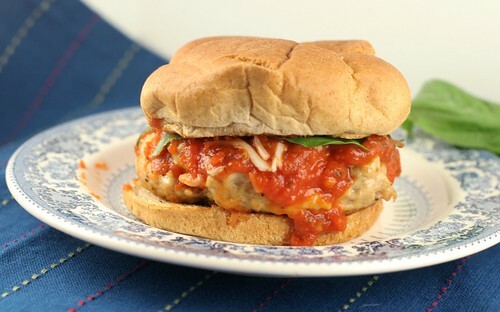 It's a juicy burger made from ground chicken, topped with marinara sauce, mozzarella cheese and fresh basil leaves. I didn't add much seasoning to the ground chicken, so the authentic chicken flavor shines through. The tomato sauce is such a great accent. 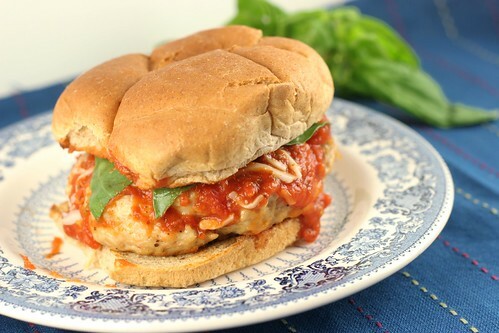 Start by making those juicy chicken burgers. I made 3 of out a pound of meat, but you could easily make 4... or 2 if you're really hungry. 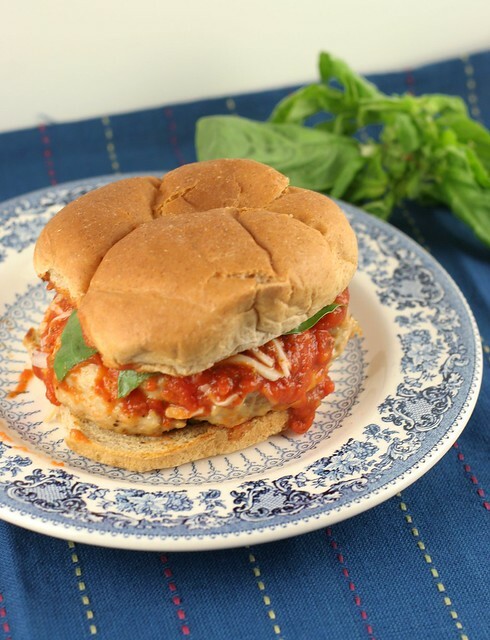 1/2 pound chicken parm burgers? I think so. I like to drain tomato sauces before I use them. This is a good trick when you're making pizza and you don't want watery tomato sauce. My mom taught me this (Hi, Mom!). Put a strainer lined with a coffee filter over a mug and pour your sauce in. You will be surprised how much water drains out! You are left with a lovely, thick tomato sauce. You could also do this by heating the sauce in a saucepan until bubbly, then just let it simmer and reduce down. So now the burgers are cooked and resting. The tomato sauce is drained. Here is where it gets really complicated. 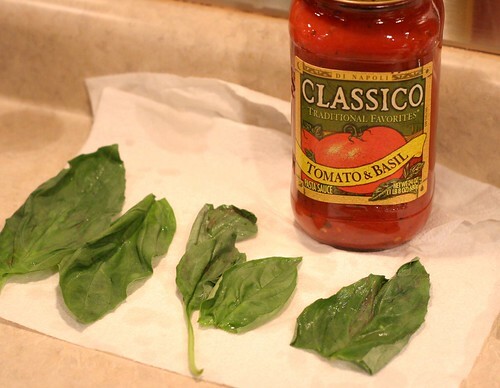 Spoon sauce over the burger, sprinkle with cheese and top with fresh basil leaves. Shew! My recipes are so complex. Now you get to bite into this beautiful creation. Dripping with tomato sauce and cheese... I will take this version of the classic any day. 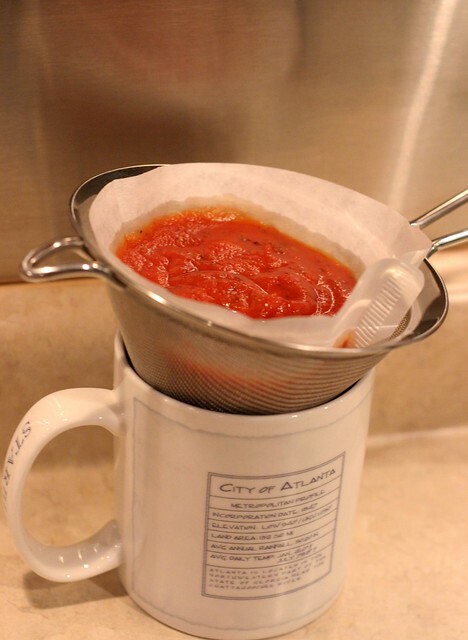 Place tomato sauce in a strainer lined with a coffee filter. Drain water from sauce and set aside. Combine ground chicken, pepper, salt and garlic powder in a large bowl with your hands. Form 4 equal sized patties. Heat a large nonstick skillet over medium heat. Spray with cooking spray. 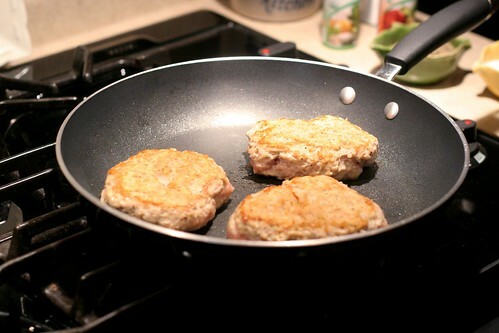 Place patties in pan and cook for 6-8 minutes on each side or until cooked through. When burgers are done, put them on the bottom of the toasted hamburger buns. Spoon 1/4 cup marinara sauce over burger. Top with cheese and 1 basil leaf. Place top bun on top and serve immediately. Now it is MY turn to say be still, my heart! 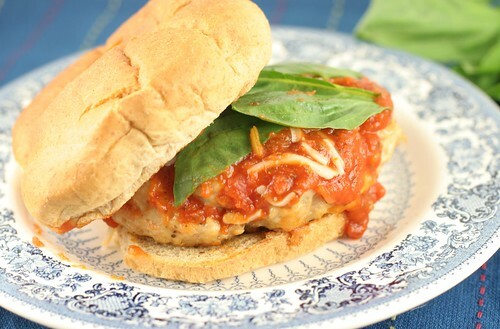 These look fantastic...all that chicken parm flavor but without all the guilt. Love. This sounds like a great burger! And it fits right in with my low carb diet (well, minus the yummy roll). I happen to have some ground chicken here just waiting for a good recipe. Thanks! When I saw the first picture I thought the white things were spaghetti noodles. I was like "Jehenna!". That would have been interesting...but glad it is just cheese! YOU ARE THE BEST COOK EVER!! (besides your mom). Love you, Jen! My daughter and I just made these for lunch. Such a yummy alternative to the standard peanut butter and jelly lunch. Thanks for the recipe! I just made these for dinner! They were delicious! I did your trick- "draining" the sauce first and it worked like a charm! I did warm up the sauce some before assembling the burgers and threw in some Parmesan cheese with the mozzarella. Fabulous- will be making again!